Desserts or even simple sweets are even more special when we make them at home. In the beginning some can appear bit overwhelming, but once we try it it turns out to be a lot less complicated. 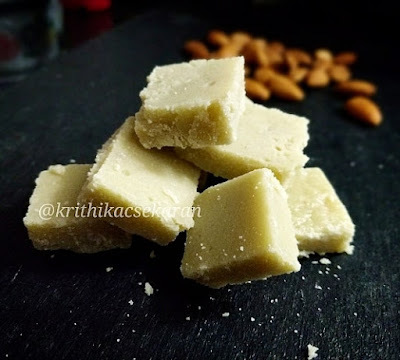 Here's a simple Badam Burfi recipe. 1. Grind the almonds to a fine paste using milk. You can grind them coarse too if you prefer the burfis to have a bite to them. 2. Add sugar and water to a thick bottom pan and keep stirring on low-medium flame. We need a one string consistency. 3. Once it reaches the desired consistency, add the badam/almond paste and stir well. Once it thickens a little, add the ghee and keep stirring on low flame. 4. Now add the elaichi powder and continue stirring till mixture starts to leave the sides of the pan completely. 5. Transfer to a greased plate or baking tray. Let cool slightly. Cut the mixture into desired shapes and let cool completely. Transfer to a clean jar and consume within a week.